My art is about personal memory in the context of the collective. I explore memory and experience, and how they are held in the body and the leakages they create — all the things that are unspoken and unacknowledged. 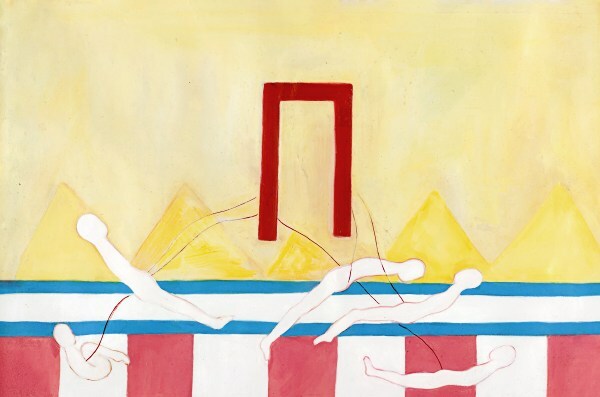 In this work, the figures of the firstborns, who are saved from the Angel of Death, are connected to the blood-covered doorposts where the Israelites dwell. The red doorpost is the doorpost of the Israelite dwellings, a symbol of the possibility of life. The figures are attached by an umbilical-like cord to Life, having been spared by the Angel of Death. The gate is a passageway between life and death, where some are spared and others meet their end. Professional Background Tal Regev’s painting are concerned with the embodied experience of trauma. She explores memory, loss, separation, and the affect of pain. Her works suggest a psychic map of what is “held” within the body. Tal holds a degree in Painting from the royal College of Art in London and has exhibited her work extensively in Germany and the United Kingdom.